Taiwanese electronics giant ASUS has announced its new smartphones at CES 2018. 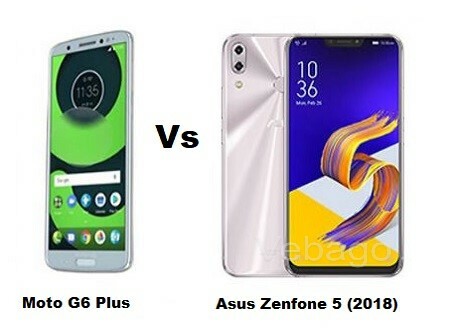 Out of that the Zenfone 5 (2018) with a notch like the iPhone X is the most popular phone from ASUS this year. The Zenfone 5 (2018) is not yet officially announced. While on the other hand, the Moto G6 Plus is also not officially announced, but the Moto G series smartphones have appeared on the leaks. Check out the Specs, Features comparison between the upcoming Zenfone 5 (2018) and the upcoming Moto G6 Plus. The Asus Zenfone 5 (2018) is expected to run on Android 8 Oreo and is powered by a Qualcomm Snapdragon 636 SoC with Adreno 509 GPU. While on the other hand, the Moto G6 Plus is also expected to run on Android 8 Oreo and is equipped with the Qualcomm Snapdragon 630 SoC with Adreno 508 GPU. Both the upcoming smartphones are expected to be priced under the Rs.20,000 in India. The Moto G6 Plus comes with the storage variants like the 3GB RAM with 32GB storage, 4GB RAM with 64GB storage, and the 6GB RAM with 64GB storage. All the three storage variants come with an expandable microSD card slot. Whereas, the Asus Zenfone 5 (2018) comes with 4GB RAM and 6GB RAM versions with 64GB storage options which can be extended using a microSD card slot. The Zenfone 5 (2018) sports a 12MP + 8MP dual rear camera setup and on the front, the device packs an 8MP camera for selfies and video calls. While on the Moto G6 Plus could come with a 12MP + 5MP dual camera setup on the rear and for selfies and video calls the phone could get a 5MP camera. The ASUS Zenfone 5 packs a large 6.2-inch IPS LCD display with a screen resolution of 1080 x 2246 pixels. A Gorilla Glass coating protects the display of the Asus Zenfone 5 (2018). The dual SIM handset gets a 3300mAh battery. The Moto G6 Plus is likely to come with a 5.93-inch IPS LCD display with a resolution of 1080 x 2160 pixels in the 18:9 aspect ratio and is also likely to come with a Gorilla Glass 3. The battery capacity of the handset is expected to be 3,200mAh.